How did you two meet? Online! On OkCupid. 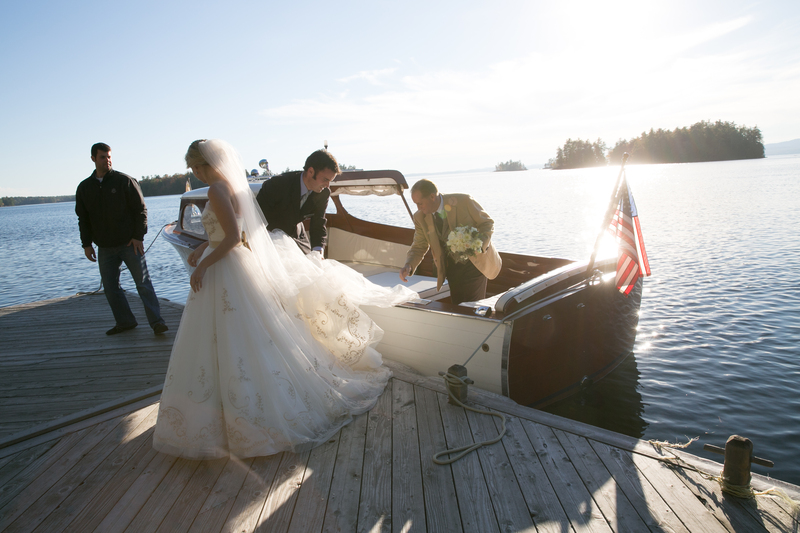 Why did you choose to get married in Maine? My family has a special connection to Maine. My mom grew up coming here in the summers to visit her grandparents who worked for a wealthy family in Old Orchard and we continued visiting throughout my childhood. Mostly to York, KennebunkPort and to Bethel, Rangely for the skiing in the winter. Did you do something that was uniquely you? 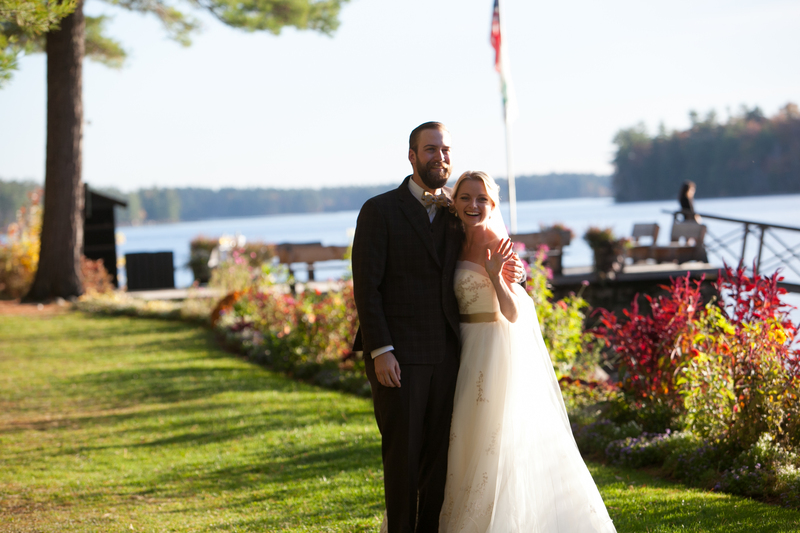 We got married in the Fall and chose a location where our entire guest list could stay on-site the whole weekend. We’re both the oldest of large families (I’m the oldest of 5, Geo is the oldest of 4) and we are also the first of either side to get married. So we knew it would be special and we wanted everyone to fill comfortable and taken care of. The night before the wedding, after our rehearsal dinner, everyone met in one of the large cabins and watched a video my father created of Geo and I (and our families) and then we played a huge game of Pictionary. Family vs. Family. We munched on Chicago style popcorn and vanilla ice cream with apple cider donuts that came from a farm stand I worked at as a kid. It was a perfect way to start the weekend. 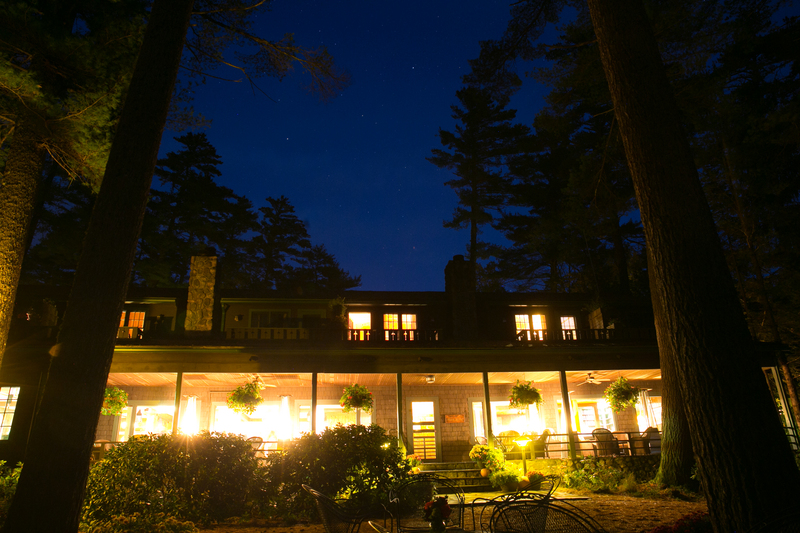 Take us on a tour of your big day… Breakfast was in the main lodge around 9. It was amazing to go greet everyone and start the day with all our loved ones. The breakfast was absolutely amazing. Some then headed over to one of the cabins for yoga, taught by Geo’s sister, Kiki. While others headed outside and enjoyed that gorgeous weather. It was sunny and in the 60’s, and this was October 25th in Maine. It had rained, poured all week. As I headed to the cabin where all us ladies would be getting ready, Geo hopped in a kayak and kayaked around the lake with some of his close family friends. This is something he talks about a lot – just how nice it was to share special moments throughout the weekend with our loved ones. 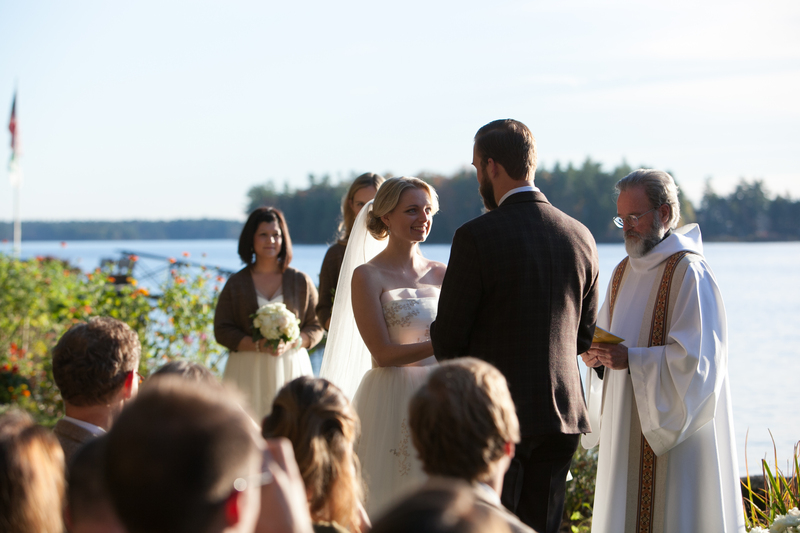 It didn’t feel rushed or tiresome, like it sometimes seems for other weddings where you’re only with people for the ceremony. We were with them all weekend, in this beautiful, romantic, rustic environment. It was very special. Us ladies got ready on one side of the venue and the boys got ready in a cabin on the other side of the venue, close to the ceremony site. Once the girls were all dolled up, they walked over to the ceremony and my dad and I headed over to the boat that would take us up to the ceremony. It’s not as over-the-top or tacky as it may sound! Haha It’s a beautiful, classic Chris Craft boat. It was so nice to spend those moments with my dad, on the water, and very cool to ride up and see everyone waiting for us. The ceremony was perfectly us. 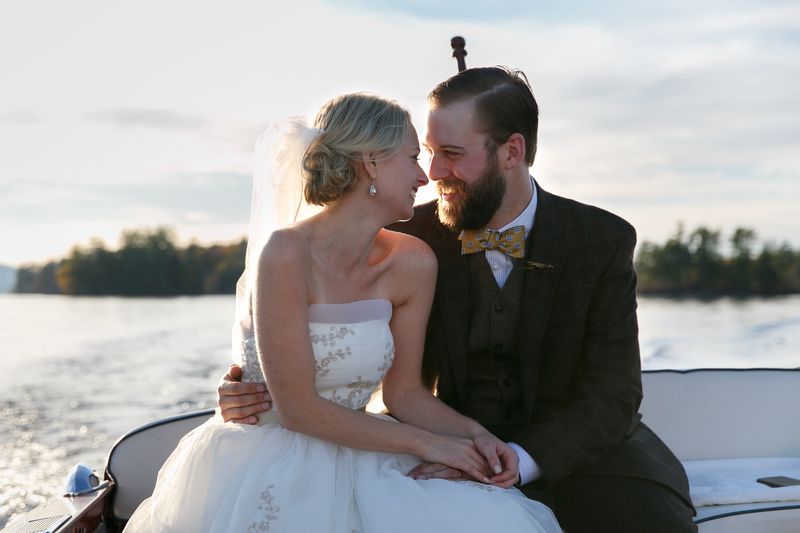 One of my favorite moments was when a ladybug flew onto Geo’s beard, I caught it and it flew off my arm – felt like good luck, for sure 🙂 As we walked down the aisle, together as man and wife, Geos uncle and cousin sang, “Home is whenever I’m with you” – one of our favorites. We had to slow down and even stop at one point, just so we could take it all in. Afterwards Geo and I got on the boat to share a few moments on the lake by ourselves. Geo and I danced to Neil Young’s, Harvest Moon, and after a couple minutes everyone, and I mean, EVERYONE came out and joined us. It felt like a big hug by our most favorite people. It was a surreal moment. We then sat down to eat and the dinner was outstanding. I wish I could have kept going but my dress wouldn’t let me! Then my father and I danced to Tupelo Honey and Geo and his mom danced to You’ve Got a Friend. Then it was time to get down, and we all did! Everyone was on the dance floor which was great because we were a little concerned that the lack of alcohol might affect the dancing – but it didn’t, at all. We served pies, pumpkin, chocolate pudding, apple and blueberry for dessert, as well as a family favorite: tapioca. The band wrapped up around 10 pm and everyone went back to their cabins, changed into warm clothes and headed to the bon fire for hot chocolate and homemade cookies. Geo’s family brought out their instruments (they’re all very musical) and had some fun on the lodges porch. I wish… I could go back in time and experience that day all over again. Not to change anything, because it was perfect, but just to feel those feelings again. 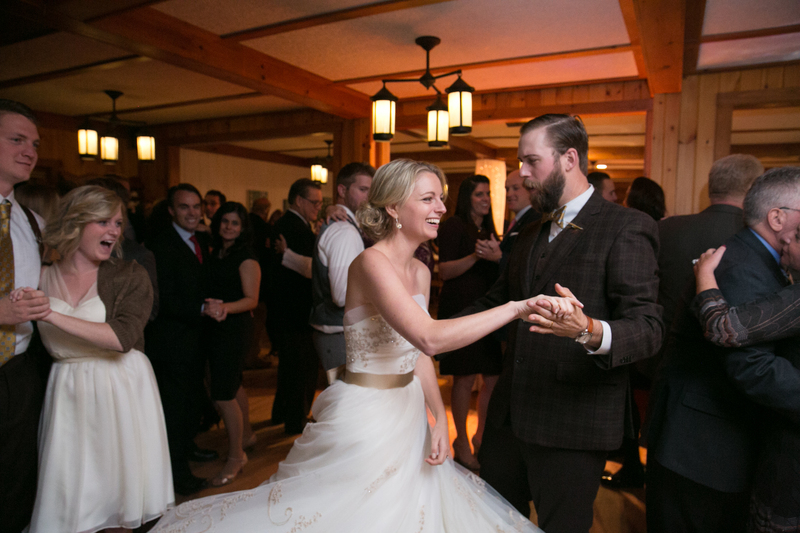 I didn’t realize… How much I’d enjoy our first dance. I’m glad that… We had a big wedding. For a while we thought we’d do a super small one but now, looking back, I wouldn’t change a thing. I really liked… our venue. It was just simply amazing. 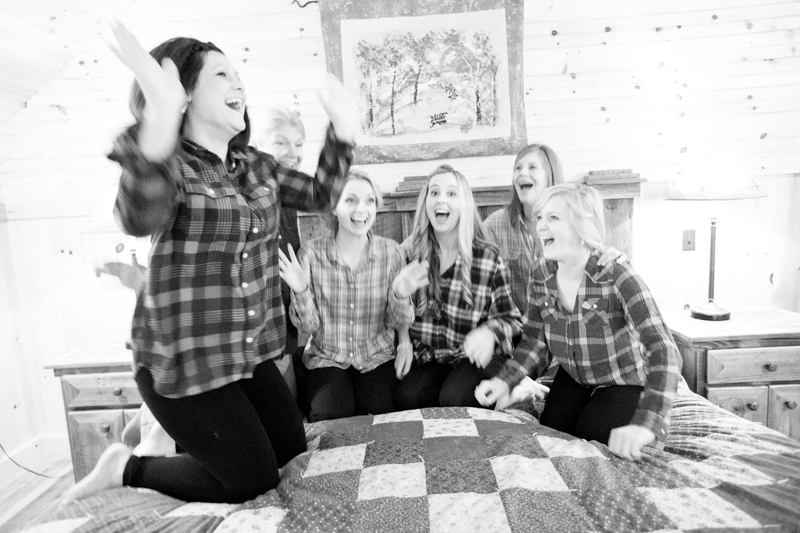 My advice to other brides and/or grooms is… get as much sleep prior to the wedding weekend as possible! I wish I had made sure to do that, I was so excited and going off adrenaline but each morning I woke up feeling groggy which I wish hadn’t been the case. < Previous Our "Save The Date"